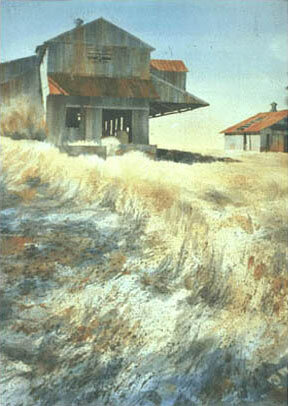 This painting demonstration was adapted from an article published by Watercolor Magic Magazine in it's Autumn 1996 edition. To view the demonstration, read the introduction below then click on the NEXT STEP link at the end of each consecutive step. Individual steps may also be viewed by clicking on the appropriate icon at the top of this page. Acrylics offer most of the positive attributes that watercolor painters admire and enjoy, while outperforming watercolor in a number of important areas. This demonstration will focus on three of these areas. Acrylics allow multiple glazes to be applied with less risk of compromising previous applications. 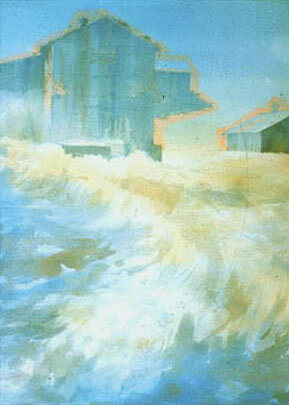 This minimizes the muddy effect that often results when consecutive applications of watercolor are applied over each other. Acrylics accommodate the use of a masking medium over painted areas without lifting pigment from previous applications. To those of us who use a masking medium, this offers a significant advantage. 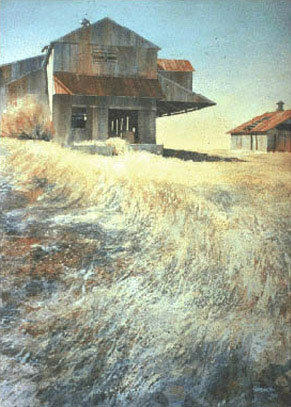 Acrylics offer a comfortable merging of transparent, translucent, and opaque passages within the same painting. This is a liberating attribute to watercolorists since opaque passages in an otherwise transparent watercolor painting usually appear to be an uncomfortable compromise. I have chosen a subject that will allow a simple demonstration of the three attributes listed. I will use a limited palette consisting of Ultramarine Blue, Burnt Sienna, Yellow Ochre, and Titanium White. In addition, I will use matte acrylic medium for mixing washes and glazes and Miskit as a masking medium. My painting surface will be a full sheet of Arches 300#, CP watercolor paper. 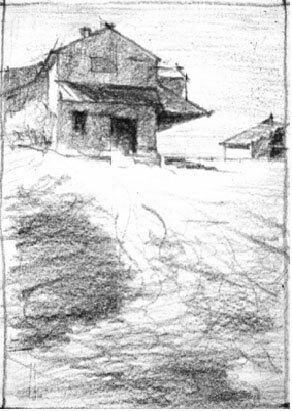 Most of my paintings begin with multiple prestudies; this 4' x 6" sketch being typical. The first studies are usually at thumbnail scale on a notepad using whatever drawing instrument I happen to have at the moment. These thumbnails may be a quick recordings of an idea or they may simply be a quick way of exploring composition ideas without the time investment required for a more elaborate drawing. If the idea is promising, I will increase the size and the complexity of the sketch to further explore shape and value arrangements. If I am not sure about the design, I will do a small color study, not over 9"x12". I find these studies absolutely necessary to the process of making design decisions and studying alternatives. I also use slides and photographs for referencing details. When I am satisfied with my design, I transfer the drawing to the painting surface. Although there are a number of adequate methods for transposing preliminary drawing information from a small sketch to a larger painting surface, I usually prefer the accurate transfer of a few major control points or lines. Then, I finish the drawing directly on the painting surface, using a #2 graphite pencil. To accommodate this transfer, I make sure that my preliminary sketches maintain the same height/width ratio as that of the final painting. When the drawing is satisfactory, I wet the paper and begin painting with light washes of color to subdue all whites that will not be a part of the finished painting. These washes help unify the finished painting and allow me to begin establishing warm and cool areas within the painting. After the paper dried, I used Miskit to mask the outside edges of the buildings. The Miskit permits multiple washes to register on the same edge, giving the appearance of a single application. I then blocked out the major shapes with light and middle value washes, and dry brush strokes using a mixture of burnt sienna and ultramarine blue. My final composition is now beginning to emerge. At this point, I can confirm or alter initial design decisions. I added the dark shapes and some detail using the same burnt sienna and blue mix that I used in the previous steps. Up to this point, I have used only transparent watercolor techniques, laying wash over wash with some drybrush and splatter technique. I have not attempted to save many of the smaller light details. Instead, I paint over them, knowing that I will be able to add them later with opaque pigment. A notable flaw is an awkward blemish, evident in the upper right hand part of the sky. This might represent a problem in transparent watercolor, however, it will be easily corrected later with opaque. At this point, I begin to refine and add translucent and opaque details over both dark and light shapes. Large dark shapes in the foreground are broken up by the addition of light opaque strokes. I also added lighter highlights and details to the building. The blemishes in the sky were covered with a new semi-opaque wash, adding a small amount of titanium white to increase opacity. 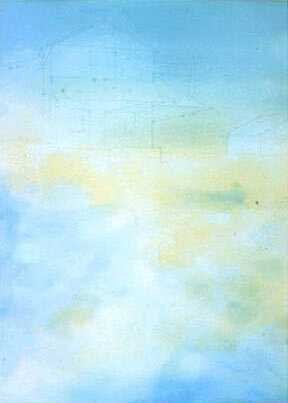 After blemishes are covered, a transparent glaze, using matte medium, water, and pigment is applied to the sky. Other glazes were applied to subdue inappropriate lights and to adjust the temperature of selected areas . Transparent glazing at this point tends to unify transparent and opaque passages by giving a transparent look to areas that are actually opaque. Technology offers positive change in almost every area of our lives. Art is no exception, so experiment with acrylics. You might just fall in love with this versatile medium.